-Can be placed on the table or has a hook to hang on wall. -With ON and OFF switch, fast and easy to use. -Uses 2 x AA batteries (not included) so needn't to worry about trailing wires or placing near a plug socket. 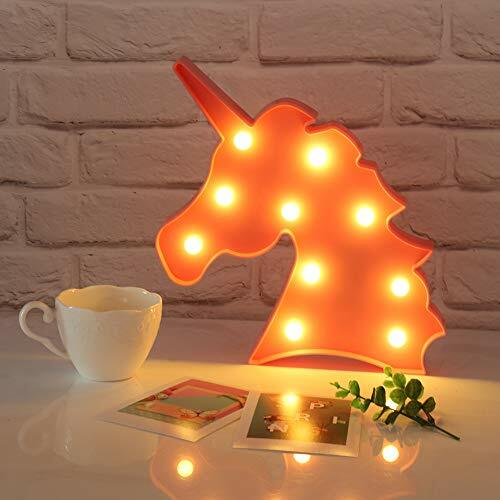 UNICORN WALL LIGHT-There is a hole behind unicorn light, unicorn accessories can be hung on the wall, also can place unicorn lighting on the table, desk, shelf, dresser or any corner in your home. IDEAL UNICORN GIFTS-Perfect gift for unicorn lover, girls, kids, baby, women, friends, colleagues, family in Christmas, Valentine's Day, birthday, and special occasions. Cute unicorn nursery lamp also a great decorations for unicorn themed birthday party, unicorn themed bedroom and unicorn novelty gifts. If you have any questions about this product by Atomcool, contact us by completing and submitting the form below. If you are looking for a specif part number, please include it with your message.